Jan. 16, 2009 | Israel's current air and ground assault on the Gaza Strip has left about 1,000 Palestinians dead, including 400 women and children. Several thousand people have been wounded and dozens of buildings have been destroyed. An estimated 90,000 Gazans have abandoned their homes. 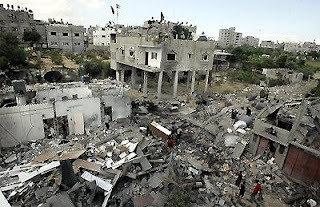 Israel's campaign in Gaza, which began more than two weeks ago, has been denounced by the Red Cross, multiple Arab and European countries, and agencies from the United Nations. Demonstrations in Pakistan and elsewhere have been held to denounce America's support for Israel. It's well known that the U.S. supplies the Israelis with much of their military hardware. Over the past few decades, the U.S. has provided about $53 billion in military aid to Israel. What's not well known is that since 2004, U.S. taxpayers have paid to supply over 500 million gallons of refined oil products -- worth about $1.1 billion –- to the Israeli military. While a handful of countries get motor fuel from the U.S., they receive only a fraction of the fuel that Israel does -- fuel now being used by Israeli fighter jets, helicopters and tanks to battle Hamas. According to documents obtained under the Freedom of Information Act, between 2004 and 2007 the U.S. Defense Department gave $818 million worth of fuel to the Israeli military. The total amount was 479 million gallons, the equivalent of about 66 gallons per Israeli citizen. In 2008, an additional $280 million in fuel was given to the Israeli military, again at U.S. taxpayers' expense. The U.S. has even paid the cost of shipping the fuel from U.S. refineries to ports in Israel. thank you for posting this article about this horrible atrocity. This will prove only the tip of the iceberg into what Bush has done in the last few years of his presidency. He's proving daily on some levels, that the lame duck / midnight regulations can be the most terrifying moment of a president's power.